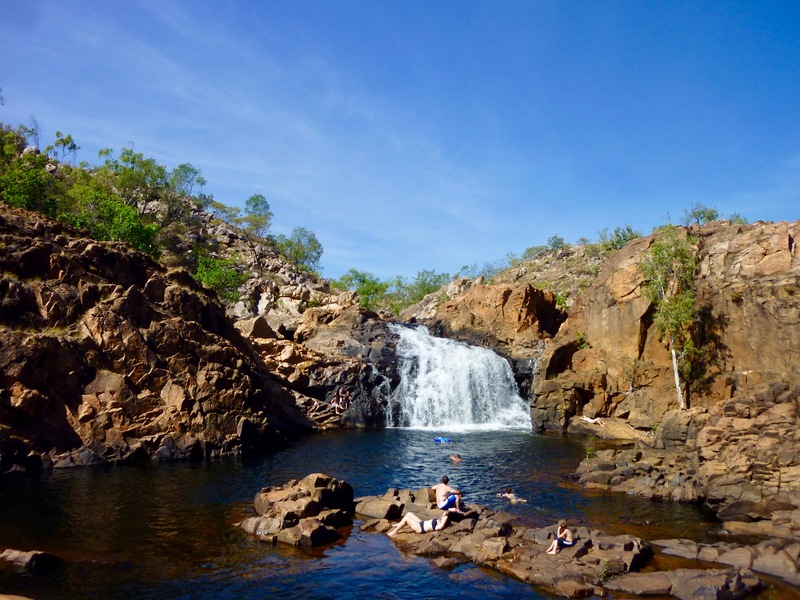 When visiting the Northern Territory it seems one could be at risk of overdose from gorgeous swimming holes. They just keep coming. 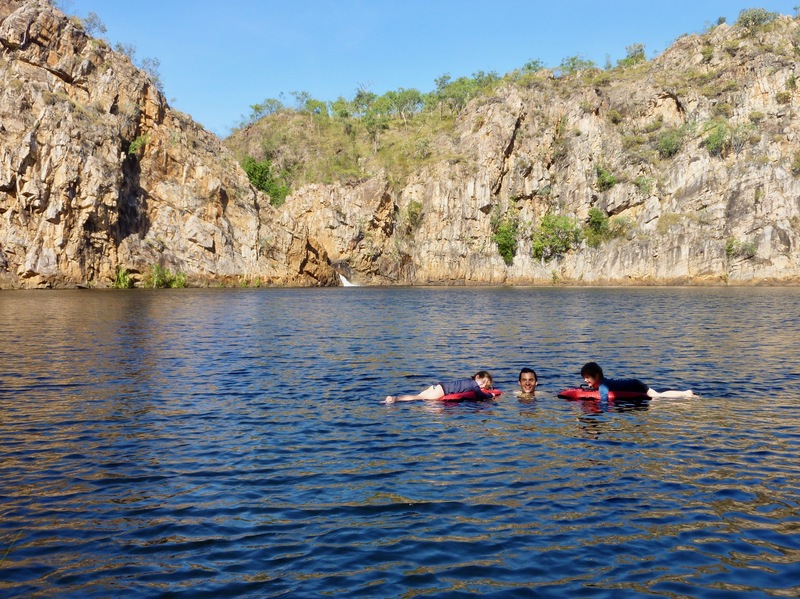 Except that, unlike museums and cathedrals, I’m not sure it’s possible to overdose on gorgeous swimming holes. 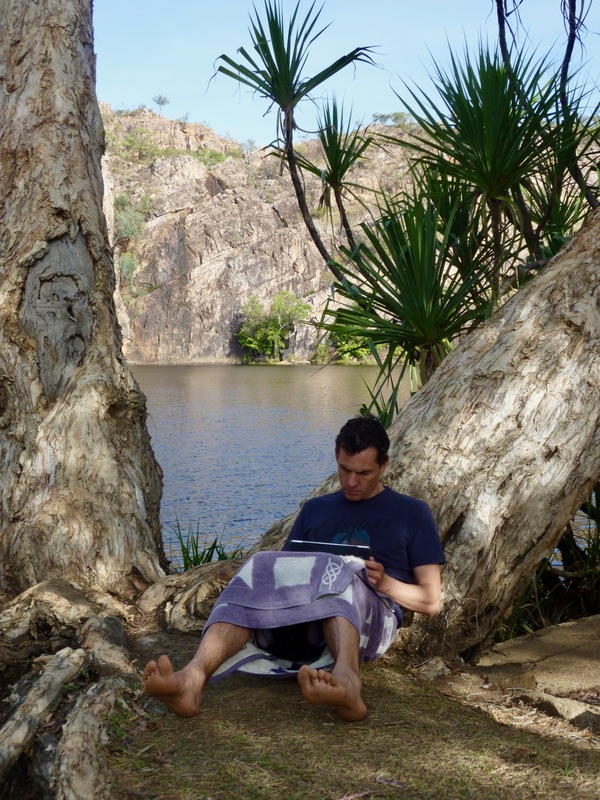 For the last two days we sat on the grassy banks of Leliyn (Edith) Falls in Nitmuluk National Park, all of a 60 km drive north of Katherine. 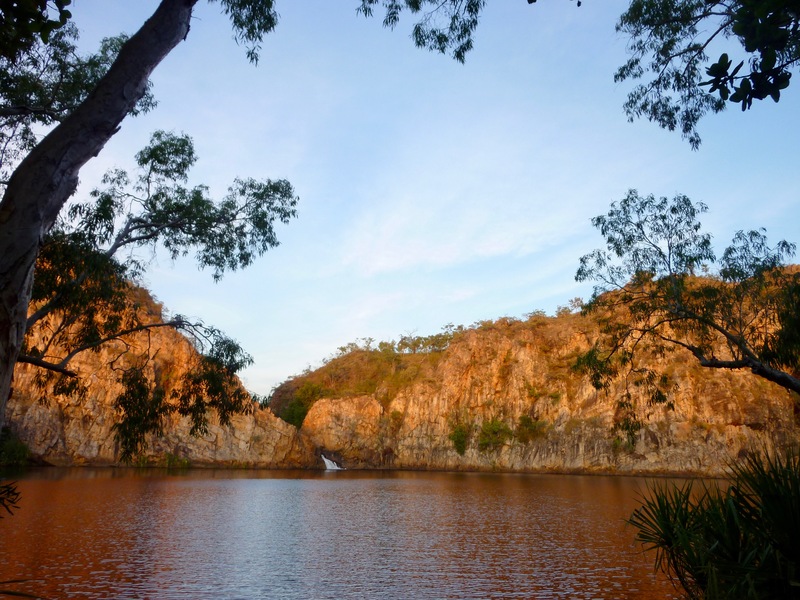 A balmy breeze drifted across the main water hole at the base of tall ochre cliffs, with foaming white water pouring in through an eroded channel on the far side about 150 m away. When it got hot we swam, and when we were cool we sat. It was just awful. So awful in fact that the next day we climbed to the pools at the top of the cliff which were even worse. More waterfalls, some big, some small, with little rapids and islands of rock for Amy and Oliver to explore – and in the afternoon, a Merton’s Monitor to keep us entertained. The National Park campground we stayed at provided each caravan with it’s own patch of lawn…it was just like having your own backyard except the grass in this one was better than ours at home. Amy and Oliver immediately set to work building a cubby with the branches around the edges. 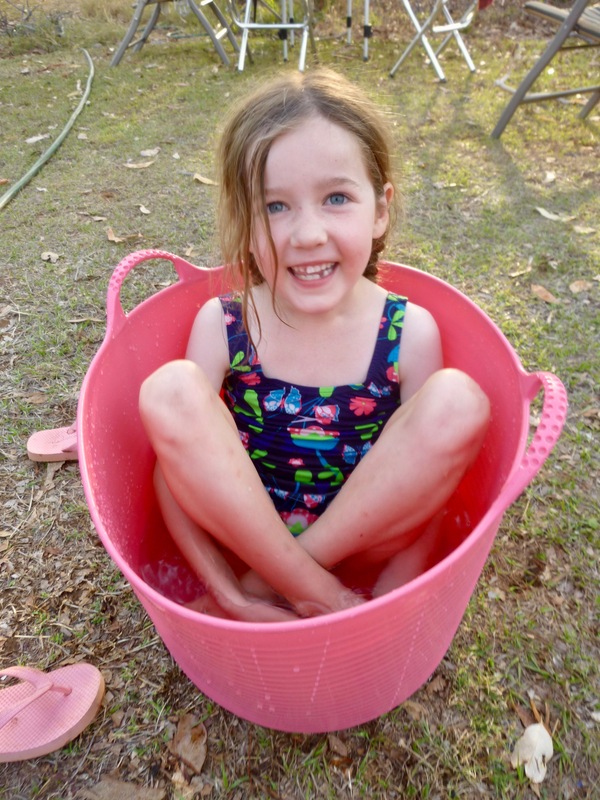 They also wanted to go back and swim as we were cooking dinner… We came to a compromise, a tub of water each to play in on the lawn… We can add that to our list of swimming experiences. I was amused by the fellow working at the check-in kiosk. Well not so much him per se but rather his European accent which is so common in these parts. ‘Welcome to the outback, I am Sven from Sweden!’. We haven’t actually met a Sven yet, but without European backpackers there is a good chance the tourist industry in this part of the world would grind to a halt. Being away from town, and in a campground without many lights we were able to experience the night sky. We took turns spotting shooting stars and finding satellites to the tunes of a neighbor playing his guitar. 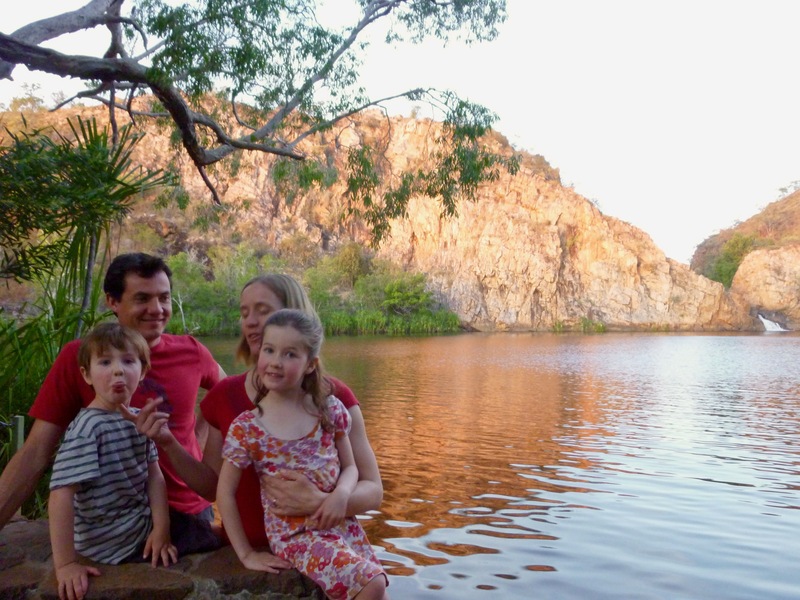 We seriously contemplated staying another few nights, but waterholes further north at Litchfield National Park were calling us. Next Day 16-18 Drink Coffee. Do stupid things faster.